The San Francisco Bay Area is rich in artists devoted to classical Indian dance forms. There are performances throughout the year, especially in Bharatanatyam, yet, the concert, Mother & Child, performed by Usha Srinivasan and her daughter, Urmila Vudali, Aug. 24, 2014, De Anza College, Cupertino, stands out. They danced a full, classical program from the opening invocation Pushpanjali to an exuberant concluding Thillana. Clarity of movement and communication of deep emotions characterized the performance. It was beautiful and very moving. Themes of motherhood and a child’s relationship to her mother were expressed through stories of Krishna, Parvati, Ganesha, and others from the human realm. For example, in a Padam selection which called upon the performers’ dramatic skills, a mother questions her daughter’s choice of a boy friend. He has wild hair and his outfit is hardly Brooks Brothers. The daughter has fallen in love with Shiva. That match is far beyond exceptional, but the situation is universal in human families. The Varnum selection was a major effort combining three aspects of Bharatanatyam: Nritta, pure dance (abstract rhythmic movements), Nritya, expressive dance, and Natya, dramatic art. It was a premiere work drawing from an array of religious/mythological stories. It demanded focus and energy from the dancers, and they were more than equal to the challenge. In fact, Ms Srinivasan’s solo piece called out such emotional connection that this viewer felt tears come to her eyes. The program included musical compositions by M.S. Sukhi for the delightful Pushpanjali, the Varnum, Amba Stuthi, and the extraordinary Thillana. 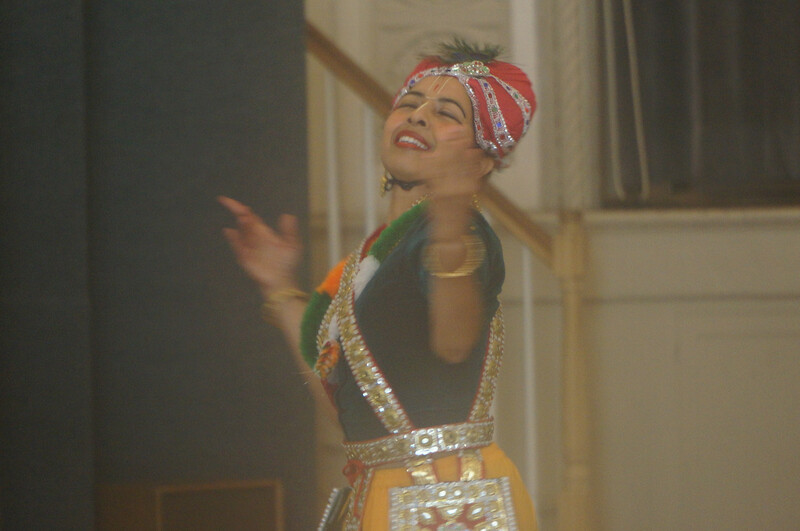 The music added extra perceptions to the event. Amba Stuthi was “an ode to Mother Amba, Goddess Parvati, consort of Lord Shiva.” The folk melody, Madu Meikkum Kanne, added texture to this well-rounded performance. The musicians, seated onstage in the traditional way, were outstanding: Sri Murali Parthasarathy(vocal), N. Veeramani(violin), M.S. Sukhi(mridangam), Navia Natarajan Menon(nattuvangam and also a dance guru to the artists). The joy obviously shared by this mother and child enveloped the audience. Eleven year old Ms Vudali has studied Bharatanatyam for five years. She danced with energy and precision. One must wonder where she goes from here as her dancing is already well formed artistry. Ms Srinivasan studied Bharatanatyam with her daughter. She proclaims herself an amateur. Being an amateur means she is a lover of this multi-layered, heart shaking art. So much of the dance, music, lyrics is devotional. It is appropriate: this was a performance suffused with love. Photos: Usha Srinivasan & Urmila Vudali, top & below, courtesy Ms Srinivasan; dancer’s ankle bells, file photo. This entry was posted in Hedgehog Highlights and tagged Amba Stuthi, Bharatanatyam, Classical Indian Dance, Jathiswaram, Keerthanam, M.S. Sukhi, Madu Meikkum Kanne, Mother & Child, N. Veeramani, Navia Natarajan Menon, Padam, Pushpanjali, Sri Murali Parthasarathy, Thillana, Urmila Vudali, Usha Srinivasan, Varnam on August 27, 2014 by Leslie. The International Dance Festival@Silicon Valley offers dancers, non-dancers, the dance audience an opportunity to study with and watch the finest artist teachers in their fields. 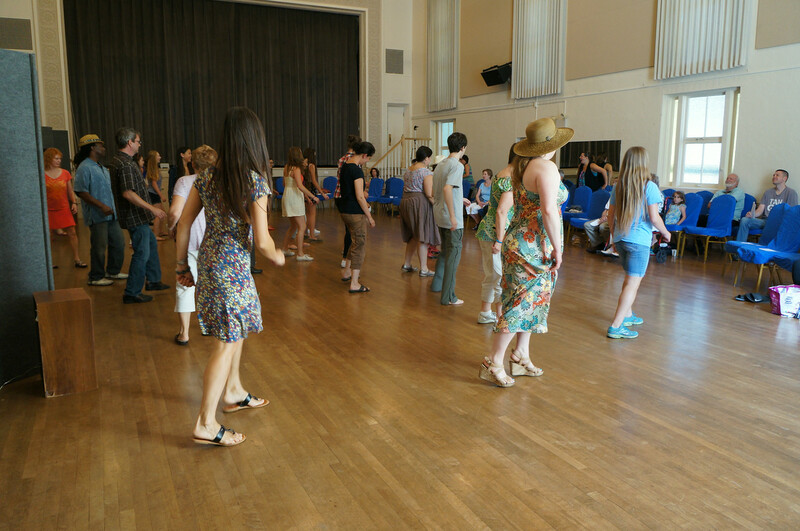 In Summer, 2014, our third season, Leanne Rinelli came from Buffalo, NY, to teach and perform Salsa; Leslie Arbogast came from San Diego, CA, to teach and perform Dunham technique/Afro-Haitian dance; Sohini Ray came from Santa Monica, CA, to teach and perform Manipuri, a classical dance of India; Audreyanne Delgado tap danced her way from Alameda, CA; Etta Walton came from Palo Alto, CA, to teach and lead Line dancing; Amity Johnson, a much sought after Pilates teacher has taught Pilates mat at all three seasons; she teaches in Menlo Park & Palo Alto; Artistic Director Leslie Friedman has based her work at the Mountain View Masonic Center since 1996. Participants in IDF@SV benefit from this wealth of talent, training, and experience. Photos: (L) Leanne Rinelli performs No Seas Cobarde; (Rt) Leslie Arbogast performs Where the River Meets the Ocean, a tribute to Ocun, AfroCuban/AfroBrazilian goddess of the river & love. This entry was posted in INTERNATIONAL DANCE FESTIVAL-SILICON VALLEY and tagged Afro-Haitian dance, AfroCuban, Amity Johnson, Audreyanne Covarrubias, Dunham Technique, Etta Walton, Leanne Rinelli, Leslie Arbogast, Leslie Friedman, Line Dances, Manipuri dance, Megan Ivey, Pilates, Salsa dance, Sohini Ray on August 20, 2014 by Leslie. The audience filled the auditorium. The only time there were empty seats was when Etta Walton invited everyone up to do Line dances with her. The Festival Concert was a tremendous success. The art of Leslie Arbogast, Audreyanne Covarrubias & Megan Ivey, Sohini Ray, Leanne Rinelli, Etta Walton truly captivated everyone. 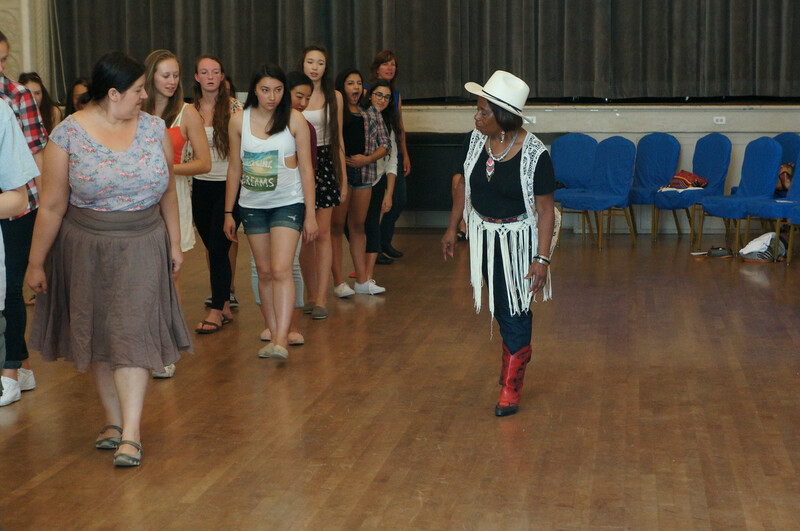 Hats off to the Festival Dancers: Kerry Aradhya, Myu Campbell, Vanessa Nudd Chapman, Julie Van Gelder. 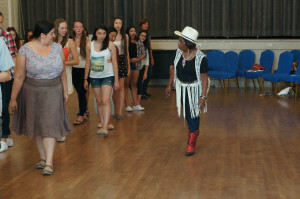 The Festival Concert was a brilliant finale to the intensive week of dancing that preceded it. Audience members, Festival Dancers, and artist/teachers all were asking about plans for next year before this Concert had even ended. Photos: (L to R, top to bottom) Etta Walton leads the audience; Audience dancing; More audience dancing; Sohini Ray, an ecstatic moment in Kaliyadaman; Audreyanne Delgado & Megan Ivey tap & even juggle in Mixed Nut Medley; Leanne Rinelli calls the moves for Rueda de Casino Salsa with Myu Campbell, Julie Van Gelder, Leslie Arbogast, Vanessa Nudd, Leslie Friedman. Photos courtesy Merv Chapman. This entry was posted in INTERNATIONAL DANCE FESTIVAL-SILICON VALLEY and tagged Audreyanne Delgado, Etta Walton, International Dance Festival-Silicon Valley, Julie Van Gelder, Leanne Rinelli, Leslie Arbogast, Leslie Friedman, Line Dances, Manipuri dance, Megan Ivey, Merv Chapman, Mountain View Masonic Center, Myu Campbell, Salsa dance, Sohini Ray, Tap Dance, The Lively Foundation, Vanessa Nudd on August 20, 2014 by Leslie. Salsa for Everyone! Come to Dance! 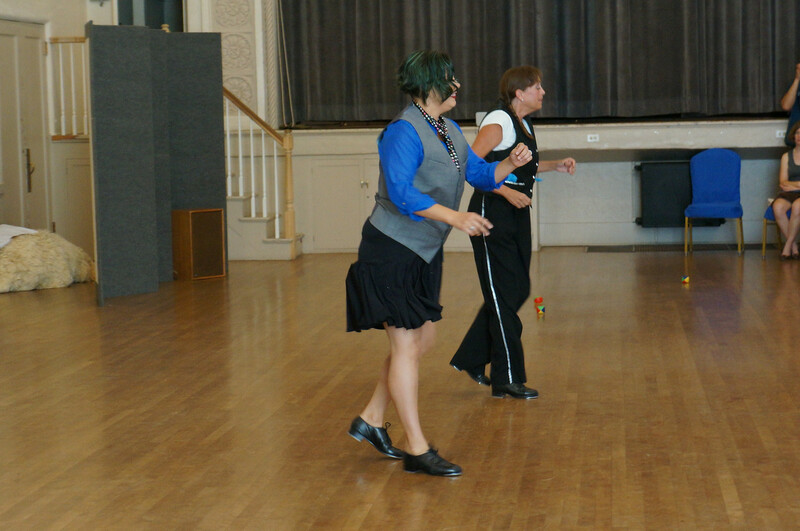 This entry was posted in INTERNATIONAL DANCE FESTIVAL-SILICON VALLEY and tagged International Dance Festival-Silicon Valley, Leanne Rinelli, Mountain View CA, Mountain View Masonic Center, Summer Dance Festival, The Lively Foundation on August 2, 2014 by Leslie. Dollars for dancing are still available. Don’t wait any longer. 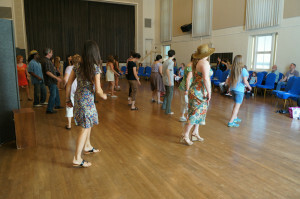 Dreaming of dancing this summer but worried about the costs? Our Festival can still offer you financial help. Contact us livelyfoundation@sbcglobal.net and let us know you want to study, create, perform. The artist/teachers are eager to help you dance your best dances. The Festival opens on August 11; email us now. This entry was posted in INTERNATIONAL DANCE FESTIVAL-SILICON VALLEY and tagged dance festival, International Dance Festival-Silicon Valley, scholarships, Summer Dance Festival, The Lively Foundation on August 1, 2014 by Leslie.